On Friday September 13, 1996, at 4:03 PM, the world lost one of its greats. We outlined the events in Tupac’s last week in a timeline. Timings are in local time (Pacific Daylight Time) and approximate. At the MGM Grand Garden Arena in Las Vegas, NV, the professional boxing match for the WBA Heavyweight championship between defending champion Bruce Seldon and Mike Tyson is about to start. Among the nearly 10,000 spectators: Tupac and a whole crew drom Death Row Records, including its C.E.O. Marion “Suge” Knight. After just 109 seconds, Tyson wins on a TKO after Seldon goes down onto the canvas two times. On their way out through the MGM Grand casino, Tupac, Suge and their entourage get into a brawl with Orlando “Baby Lane” Anderson, a known member of the Crips. They knock him to the ground and proceed kicking him. The fight is in part captured by hotel security cameras. The Death Row crew arrive back at the Luxor Hotel where they are staying. Tupac changes clothes, from a silky orange shirt he was wearing during the fight, to a green basketball shirt. He has a discussion with his finacée, Kidada Jones, and asks her to stay at the hotel and not join him to the Club 662, where he’s supposed to perform. 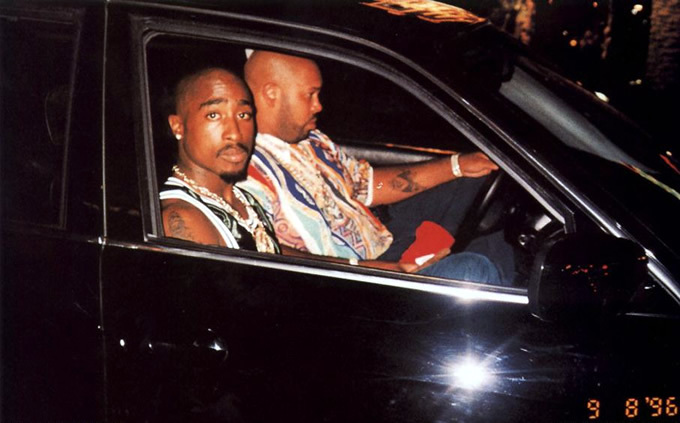 While driving towards Club 662 (at 1700 East Flamingo Road) in Suge’s 1996 BMW 750iL, Tupac gets his famous last picture taken by an acquaintance, 29-year-old Leonard Jefferson. Some ten to fifteen minutes later, the car is stopped by the police for playing its music (Tupac’s soon-to-be-released The Don Killuminati: the 7-Day Theory) too loud and for not having its license plates displayed properly. 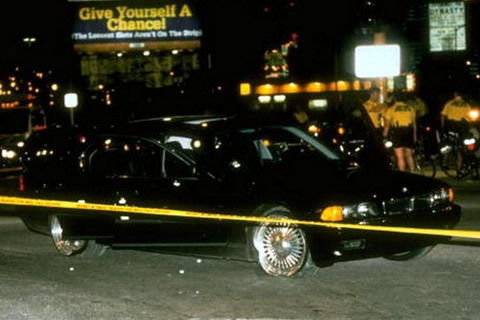 Suge’s car, with behind them several other vehicles carrying Death Row staff (including Tupac’s personal bodyguard Frank Alexander), comes to a halt at a red light at East Flamingo Road and Koval Lane. While Suge and Tupac are chatting to a car full of young women that had pulled up to their left, a white late-model Cadillac with four men inside, pulls up to their right. 13 shots are fired from the Cadillac, hitting Suge’s BMW. Tupac gets hit while trying to out of the bullet rain. The Cadillac immediately takes off onto Koval, while Suge makes a U-turn heading back towards The Strip. After running a red light, blowing two tires and getting stuck in traffic, police stops Suge’s car near Las Vegas Boulevard and Harmon Avenue. An ambulance is called and Tupac is brought to the University Medical Center of Southern Nevada. After arriving at the hospital, close to midnight, Tupac immediately undergoes surgery for over two hours. Marion “Suge” Knight, who got slightly injured during the drive-by shooting, is released from hospital. Tupac remains in critical condition, while the media report on Tupac’s second shooting in less than two years. Tupac undergoes more surgery, during which his punctured right lung is removed to stop internal bleeding. Police keep patrolling outside the hospital. A “misunderstanding” by the Las Vegas Metropolitan Police Department leads to a big argument between them and a group of about 20 friends and fans of Tupac outside of the hospital. Four men are handcuffed for a while, but later released without any arrests. After avoiding the police for several days, Suge Knight and his attorneys speak to the LVMPD about the shooting for the first time. Reportedly, he only tells them he “heard something, but saw nothing”. Their encounter lasts about an hour. Tupac Shakur is pronounced dead. Physicians list the cause of death as respiratory failure and cardiopulmonary arrest. His mother, Afeni Shakur later looks back at the event: The doctor came out and said that Tupac had stopped breathing three times, and they had revived him three times. Every time they revived him, he just went back. And I asked them to leave him alone and to let him go. I really felt it was important for Tupac, who fought so hard, to have a free spirit. I felt it was important for his spirit to be allowed to be free. The coroner’s medical examiner performs an autopsy on Tupac’s body. Tupac’s body gets transferred to Davis Mortuary, where it is cremated.